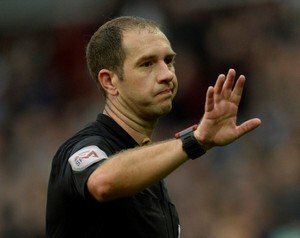 Jeremy Simpson from Lancashire is the man in charge of our Boxing Day game at the University of Bolton Stadium (formerly known as the Macron Stadium and Reebok Stadium). This will be Jeremy’s third time in charge of a Millers game this season, the first being in August when Hull City were the visitors to the New York Stadium. Richard Wood put the hosts in front just after the quarter of an hour mark with Jackson Irvine equalising for City twelve minutes later. Fraizer Campbell put Hull in front just before half-time with Irvine scoring again two minutes into the second half. Jamie Proctor came off the bench to make it three-two and make it an interesting last fifteen minutes but the Millers couldn’t get anything from the game. Wood was booked for the hosts and Marcus Henriksen for Hull. The last time we had Jeremy in the middle was in October at Preston. Five minutes before half-time Tom Barkhuizen put the hosts in front with a Michael Smith goal on fifty-five minutes getting a point for the Millers. September 2016 saw Jeremy take charge of the Millers at the Coral Windows Stadium which saw a twenty-first minute Romain Vincelot goal give Bradford City the win. Four minutes into time added on at the end of the game Joe Mattock got his marching orders after receiving a second yellow of the afternoon. Richard Wood and Kieffer Moore also saw yellow for Rotherham that day. The season before Jeremy was in charge of five games involving the Millers – the last one being our one-nil home win against Ipswich, when a seventy-ninth Tom Adeyemi goal gave Millers a much needed, but too late, three points. Joe Mattock and former Miller Toumani Diagouraga saw yellow that day. A few weeks earlier he was in the middle for our game at Molineux when an Andreas Weimann goal on the stroke of half-time gave the hosts the win. In February he was in charge of the one that most Millers want to forget at Cardiff when it was a five-nil win to the Welsh side. Substitutes Aimen Belaid and Anthony Forde were the only players to see yellow that day. In January Jeremy was in the middle for our game at St James’ Park when Newcastle were four-nil winners. Joe Mattock and Richie Smallwood were shown yellow cards that day. Jeremy was also in charge of the Millers in December when a twenty-fourth minute Izzy Brown goal gave Rotherham a home win over Queens Park Rangers. Lee Frecklington, Anthony Forde and Tom Adeyemi saw yellow for the hosts that day with Rangers getting three yellow cards too. The season before saw Jeremy in charge of the Millers three times, the last one being our goalless draw against Wolves at Molineux. He was also in the middle for our away game at the Cardiff City Stadium in January with both sides getting a point each. Anthony Pilkington opened the scoring for Cardiff on twenty-five minutes with Joe Newell equalising just before half-time. Pilkington then kindly put the Millers in front with an own goal on forty-nine minutes and scored his ‘hat-trick’ equalising for his own side on the hour mark. A two-footed challenge on Jonson Clarke-Harris saw Lee Peltier get an early bath after a second yellow card six minutes from time. Jeremy was also in the middle for our home game in October against Reading at the New York Stadium. Nick Blackman opened the scoring on twenty-six minutes for the visitors but a goal three minutes into the second half from Danny Collins gave the hosts a point from the game. Danny Collins and Harry Toffolo were booked that Tuesday night. The time before he was in charge of our game at the New Meadow in January 2014. First half goals from Tom Hitchcock, Ben Pringle and James Tavernier gave the Millers a three-nil win and all three points. Hitchcock, Rob Milsom and Mark Bradley saw yellow for Rotherham that day while Jeremy also booked three Shrewsbury players. Jeremy was at the New York Stadium back in September 2012 when a goal from Alex Revell on thirty-four minutes was the only goal of the game. That day Jeremy booked four players – Ian Sharps, Nicky Hunt and Ben Pringle from the hosts and Torquay’s Aaron Downes. Running the line this Boxing Day we have Nick Hopton and Philip Dermott with the Fourth Official being Oliver Langford from the West Midlands.